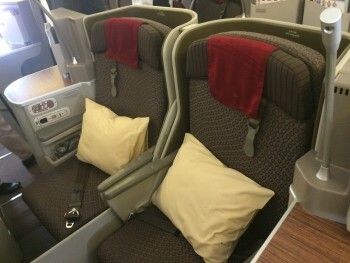 My review of Garuda Indonesia business class – flying Gatwick to Amsterdam! One of the perks of running this site is that I can justify doing slightly odd trips in the name of ‘research’. When Indonesian airline Garuda announced that it would add a tag to London Gatwick to its existing Amsterdam to Jakarta flight, I knew that I should give it a go! 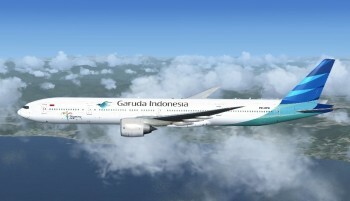 Garuda used to fly from Amsterdam to Jakarta using an Airbus A330, a flight which required a stop in Abu Dhabi. When brand new Boeing 777-300ER (the ER stands for ‘extended range’) aircraft arrived in 2014, it had the capacity to fly non-stop from Amsterdam to Jakarta. When the Gatwick flights were first announced, Garuda was selling one-way tickets in business class to Amsterdam for just £100. It later crept up to £150 and is now at £235. I couldn’t justify that, but luckily Garuda Indonesia is part of the Skyteam alliance. 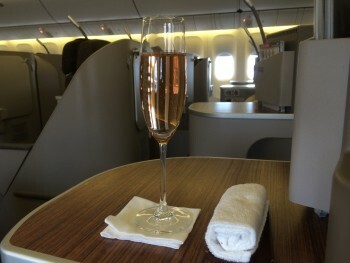 I had a few Flying Blue (the Air France / KLM scheme) miles sitting around and topped them up to 30,000 with some American Express Membership Rewards points. The Garuda flights can be booked online via Flying Blue. Garuda uses Gatwick North, the British Airways terminal. Check-in was, unsurprisingly, fast given that the plane departed with only 9 of the 32 business class seats filled. The premium security lane – which is now totally separate from the main security area – was almost empty. Garuda uses the excellent No 1 Traveller lounge at Gatwick North which I reviewed here. You are guaranteed entry – I mention this because the lounge has a reputation for turning away Priority Pass visitors at busy times. Departure was 12.25. Annoyingly, Garuda has joined the list of airlines who no longer put departure times on their boarding passes. All it said was ‘Boarding time: 11.20’. You would have to be a bit of a mug to turn up at the gate for that time. You would be an even bigger mug if you followed their advice to “please be at the boarding gate at least 30 minutes before boarding time” – which would be 95 minutes before departure! 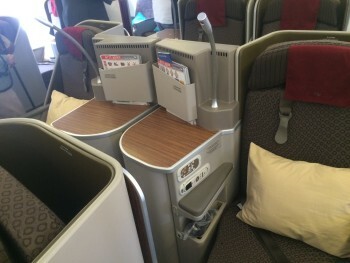 The 32 business class seats are split into two cabins. Eight seats are between first class and galley with the remaining 24 behind. I was in the the latter. …. 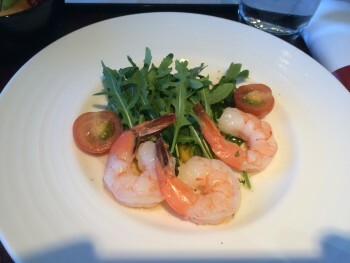 which may bring a smile to regular British Airways Club Europe passengers who are used to the famous BA ‘three prawn’ salad! It certainly didn’t count as a substantial meal, but those passengers heading to Jakarta would be getting a full meal two hours later anyway. With more passengers joining in Amsterdam, it would also not have been possible to serve the first part of the main meal. And that’s about it. London to Amsterdam is not exactly a long flight! On the back of this short taster, though, I would be happy to recommend Garuda Indonesia’s business class service to anyone heading down to Jakarta. How much were the tax and fuel surcharge on your award ticket? Whenever I’ve checked the price for intra-Europe award flights using FB miles, they’re more then the equivalent cash fare! £53 I think, off the top of my head. Maximum 60/70 euros. Mind you, I can’t bring that flight up, I guess I could call and book it. We’re seriously thinking of using them all the way next year in Business…from AMS though, to keep the charges down, with a short hop from Southampton to get over there. I hear this flight might be going away, something to do with the runways at CGK not being strong enough to cope with the 777-300ER at MTOW, and thus suffering damage. I believe Garuda face the choice of another stop to keep take off weights down or adjusting the route in some other way. It beggars belief that they didn’t realise this would be a problem BEFORE they ordered the jets. It is being cut back to three a week. I was going to add all that detail in but I thought it would get too confusing. As an avid collector, I must ask: how was the amenity kit? Did you get one, even on this short flight? I didn’t get one on the short hop. I don’t know about Raffles though! One thing to note as well, was that all passengers had to disembark at AMS, including those continuing to Jakarta. No I didn’t. I meant to mention that in the review but forgot! Not getting one is an improvement on BAs latest CW offering, there is nothing more symbollic of the direction BA is headed. 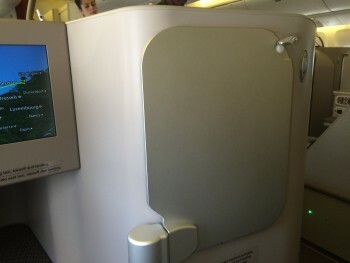 The other bit of IAG has learnt though….flew this layout on Iberia to the US and really liked it too. Finnair has something sumilar but a little different with their so called throne seats on the A side. Will be replaced on a350s though with latest version of seats used by CX if reports I read are correct. I will get chance to experience the seat on Etihad next month to EDI. Not sure how it compares to Swiss Business, but their ‘throne/Captain Kirk’ seat (with desk either side) had, I found, a really small cubby for one’s feet – I felt almost slightly claustrophobic when lying out in it as I couldn’t turn from one side to the other. In the future I was thinking to aim for one of the seats where the foot area is a bit more open. I had he same experience with the inner two middle (honeymoon)seats on an IB 330. It felt like my feet were in a shoebox It felt strange laid on my back with feet to either the left or right as there was no chance of my size 9s pointing up. With the extreme heat in the cabin as a bonus it was the most uncomfortable overnight flight ever, never slept a wink. Today I booked LAX-MAD IB 346 a bargain at 42500 and 109euro pp (includes phone booking fee) as could not get it to go through online. I will be looking for the Isle seats as they look to have more foot room even though we are travelling as a couple. Despite flying Swiss for two years I missed out on trying the seat due to retrofit delays. I believe the AY seat and cabin layout is identical. I opted for K side and a swat immediately adjacent to window. Both my flights were daytime back from BKK so had no need to go full flat. I canbot recall what space was like but these cubby holes in general are quite tight. From the pics, the seats look exactly like the Etihad ones (not new ones in the A380) down to the tray, small armrest on the right, larger area on place things on the further right. As you’ve flown the Etihad J product, would you agree? Do they sell F on that segment too?! £440 one-way out of London! If loads on your flight were typical then they are missing a trick to generate extra revenue. Has anyone flown with them in Y to Amsterdam? The flight keeps coming up in my searches and the timing and cost seem ok. Thought about doing it for the novelty factor and fed up of paying nearly double to fly BA.Actually considering Southend Airport too! There are a whole lot of trip reports on airliners.net. 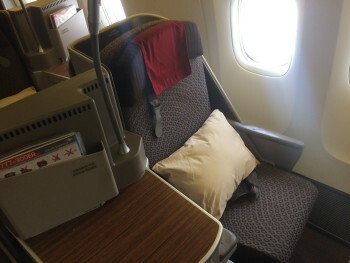 I flew Garuda to Jakarta from LGW in May , First Outbound and Business Return (I upgraded at Gatwick to First for £406) First Class without doubt was one of the best flights i have ever taken including First on BA, EK , SQ and CX , nothing was too much trouble and the service had to be experienced to believe. The Return wasnt so good , the worst part was the layover at AMS for 2 hours , knowing that you only had a 40 minute flight to be home. The blame for the runway cant be put on Garuda , they where flying within the take off limit , the airport owner has noticed cracking and has reduced the payload for take off , the 3 weekly AMS direct flights leave without a full load in Y . In future only 3 flights per week will fly to LGW , which are routed direct from CGK , 3 other weekly flights will route via SIN and finish at AMS. Simon, may I ask what is the typical cost of business return exLGW? I’m impressed with your airport uprade offer, EY recently quoted me £500 Y to J for just EDI-AUH. I’m tempted to try amidweek Y and try an airport upgrade if I can find some info on typical J loads. Garuda ordered a bunch of 787sand a350s this week, I guess thatwill herald the end on the 777s andthe runway problems. The cost of business class is from about £1800.00 upwards which is a non refundable no change fare , i paid £2500 which was C outwards and I class inbound , the C class is upgradeable but the I class isnt. The same applies for Economy , Garuda operate a system on all routes where only certain fares can be upgraded at the airport or by miles ( unlike BA with Airport upgrades) the upgrade price from LGW from economy to business is around £400 each way , so i would suggest buying a business class ticket rather than economy as it will work out more expensive unless you require flexibility. Thanks Simon, the flexibility is important to me too and main reason I persist for the moment with BAs expensive redemptions despite the great fares available from QR etc. This month I passed up on a £1200 EY J return from EDI-BKK in favour of a cheap Y fare I planned on upgrading with cash and/or miles. It didn’t work out as I planned and now scrambling to get some valie out of EY before devaluation. Hasn’t Etihad stopped the free chauffeur for Z fares? Had no problem booking it with my Y-J miles upgrade back to EDI. Actually using it for a 65 mile journey to see my parents on my return. Oddly, if you do a cash upgrade you don’t get it (if I’m understanding correctly) despite the sums required for a cash upgrafe markedly exceeding that for a miles upgrade assummingyou value a mile at the approximate 0.58p you said they effectively sell them for if doing cash and 75% miles. My trip has been a bit of an eye ppener, left scratching my head when it comes to the rationale underpinning Etihad Guest. Will get the facts and figures together and forward them to you on my return.